Last month’s article addressed the installation of the radiator and related components in the engine compartment. 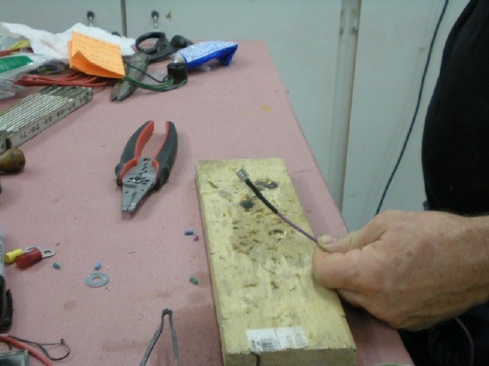 This month we’ll look at electrical wiring. Last month I led off my mentioning that the cooling system on the E-Type had a negative reputation. Well, I am sure that the reputation of the Lucas electrical system on the E-Type and other British cars is no better. There is a reason that Lord Lucas is known as the Prince of Darkness! With this thought in mind, I put my engineer’s knowledge to work to try and come up with some improvements. The first and foremost problem with most 12 volt automotive electrical systems was and still is connections. Connections can and will degrade over time. Degradation generally is represented as an increase in resistance. As the resistance goes up, heat is generated. Higher temperature generally increases the resistance further and eventually a burned out connection results. So my first job was to concentrate on making really good connections. 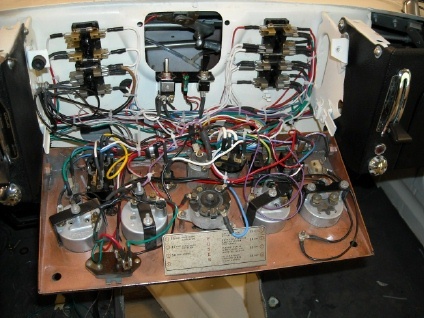 Original specification wiring harnesses can be purchase for the E-Type. For a true concourse restoration I am afraid the original style harness is a must, as it has a distinctive woven cloth covering. British Wiring (www.britishwiring.com) and others will sell you an authentic harness. Hold on to your wallet! A complete set of harnesses runs well over $2000. The OEM harness uses “bullet” connectors. In principle, these connectors are sound in that they have plenty of surface area for electrical contact. But I think that the abrupt transition from the solid connector to the stranded copper wire leads to failures due to flexing and fatigue. I decided to circumvent this problem by going with a more modern but time consuming solution. That would be soldered spade connectors with heat shrink tubing. More on that later. Step 1: Strip the wire about 1/4"
Step 2: Solder the wire to the female blade terminal. 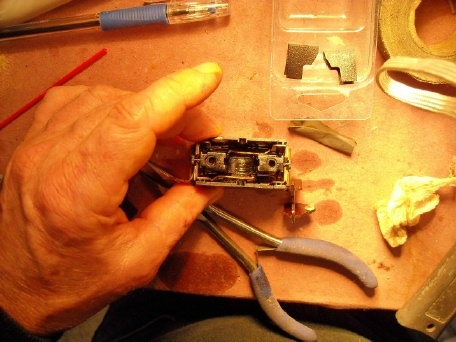 Blade terminal is crimped for a mechanical connection before soldering. harness. 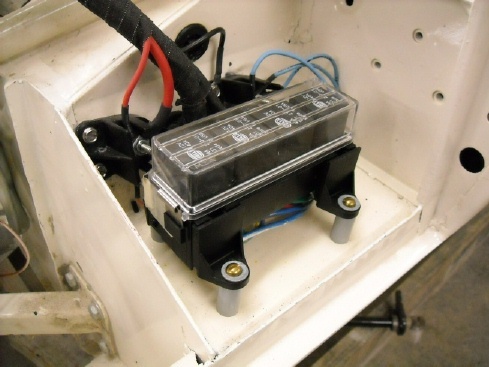 This avoids problems with poor ground connections when using the chassis as the ground circuit. which only needs a small wire from the alternator to do its job. The full current from the alternator is routed a short distance within the engine compartment to a “load center” where power is distributed more directly to the various components. message that you want your lights, horn, A/C, etc. turned on and the relay does the heavy lifting of switching on the heavy current required for the device, back at the load center. Relays ensure that virtually full system voltage and current reach the component needing it. This is especially important to allow headlights to shine at their brightest. 4 Relays with enclosure used to control fans, lights, horn, In background you can see 2 common wiring terminals for 12 volt in/out. are two heavy duty wiring terminals. 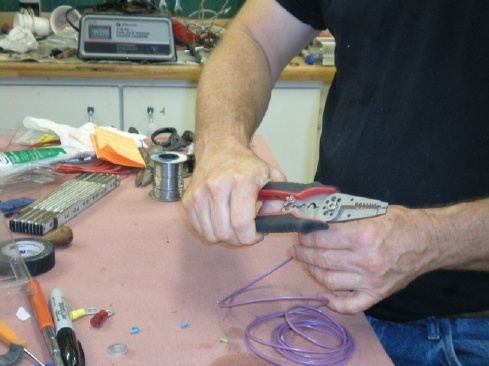 The largest red wire is a 10 gage lead from the alternator. From there, the full power of the alternator is distributed out to various subsystems. Note that at this point, the wiring hasn’t entered into a traditional fuse box. For system safety, fusible links are used at this point. Fusible links are a one time system that will melt locally and prevent further overloads (and possible fires) inside the passenger compartment. The light blue wires in the photo are fusible links. They are cheap insurance. Anyone familiar with an E-Type will recognize that my load center has replaced a small rats nest of components that normally reside in this location. The other feature of my system that makes this simplification possible is the use of a modern internally regulated alternator. In other words, voltage regulation is internal to the alternator and allows the elimination of the externally mounted OEM voltage regulator. Not concourse but a vast improvement. Now back to the wiring connections. Most of the components on the E-Type use a ¼” male spade (or blade) connector. The wiring is connected using a female spade connector. These are common on many cars and available in quantity from NAPA. The following sequence of 4 photos shows the basic process. 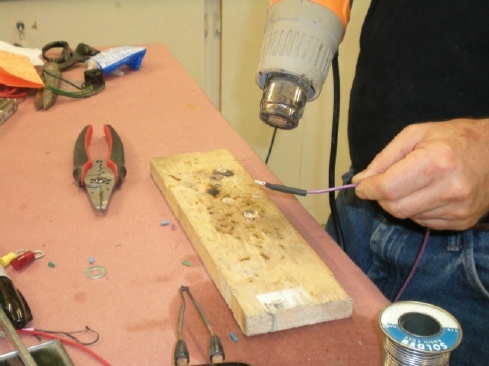 Strip the insulation off the wire about ¼”, insert the bare wire into the connector, crimp, solder, and fit a heat shrinkable tube over the connection. 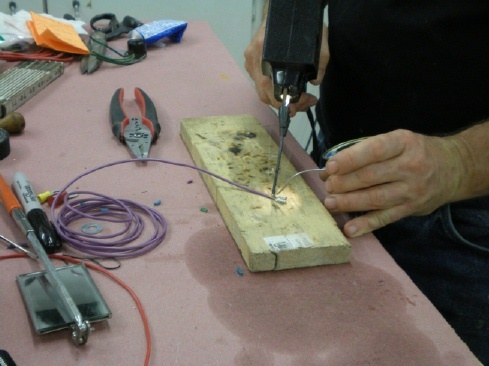 The key improvements are that the soldered connection is very good electrically and the heat shrinkable tubing provides a springy interface between the flexible wire and the rigid solder connection. Another issue that I tried to address was the reliability of the dashboard switches. Replacement units were questionable and expensive. I finally worked up the courage to carefully open each switch and clean out the internals. Use an electrical contact cleaner (such as CRC brand) and Q-tips. So can I say that all this is worthwhile? Only time and hopefully improved reliability will tell. I do know that it took me about 6 weekends to assemble and install the harness. It turned out, as usual, to be a greater undertaking than I had anticipated. About par for the course! And finally, I must give credit to the folks at Mad Electrical (www.madelectrical.com) for many of the ideas that I utilized. Their publications are most informative.